As part of their current exhibition, Patrick Kelly: Runway of Love, the Philadelphia Museum of Art is featuring a web tutorial on the construction of the designer’s one-seam coat. I analyzed Kelly’s technique and partnered with the PMA’s graphic design team to create this feature for the museum’s website. Kelly took a large piece of uncut fabric and used origami-like folds and a single seam to create an oversized cocoon coat. This technique of manipulating fabric instead of cutting and sewing separate pieces to achieve the desired shape has also been employed by designers such as Cristobal Balenciaga and Issey Miyake. 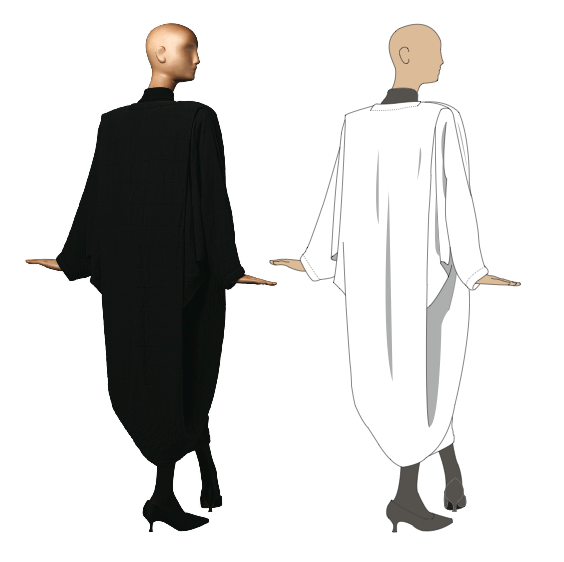 Photo and illustration of Patrick Kelly’s one seam coat. Patrick Kelly was active in the 1980s but received little recognition when starting out as a fashion designer in the U.S. His career gained momentum after moving to Paris thanks to a one way ticket he received from an anonymous friend (later revealed to be from his friend and model Pat Cleveland). Kelly’s silhouettes celebrated the shape and size of every woman and his designs reflected his personal cultural background. Kelly’s short but prolific career came to an end when he succumbed to AIDS in 1990. 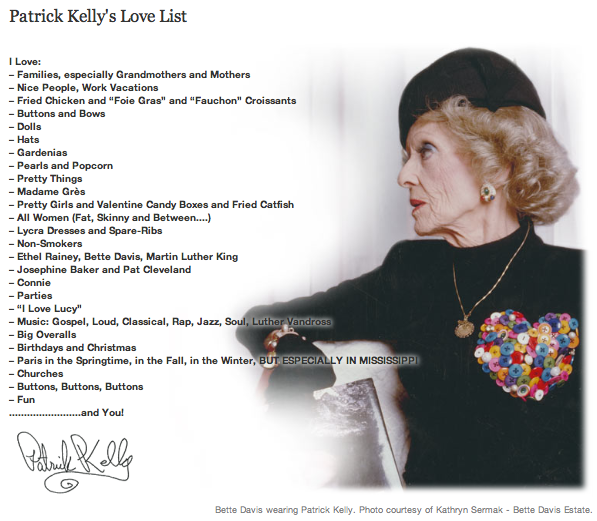 Patrick Kelly’s Love List featured on Philadelphia Museum of Art’s website. This entry was posted in Exhibition, Research and tagged One Seam Coat, Patrick Kelly, Patrick Kelly: Runway of Love, Philadelphia Museum of Art. Bookmark the permalink.